What I’m about to write about isn’t a secret. It’s on the parliamentary record, and the occasional web or print news article has touched on it. But, as far as it possibly can, the government keeps it very much under the radar. So it may well be, esteemed visitor to this blog, that you’ve never heard about it. If you’re a regular (esteemed) visitor, you’ll know that I’ve written frequently about the NHS and I’ve written at length about the government’s attacks, current and future, on it. I don’t work in the NHS, but I do recognise the enormous importance to our society of healthcare ‘free at the point of need’ and the doctors, nurses and other staff who provide it. I also recognise that it’s a prime target for the Tories’ state-stripping ideology. In the course of my research for various articles over the past couple of weeks, I’ve been reading through some of the written evidence submitted to the Commons Health Select Committee on NHS funding. It’s in the course of this research that what I’m going to tell you now really came to my own attention, and I keep a close eye on NHS-related developments, so it’s entirely understandable if you weren’t aware of it until now. If you’re a regular reader, excuse me repeating all these points, but I try to consider first-time readers and the importance of context for properly understanding what this government is up to. Hunt’s and the Treasury’s measures are aimed at eroding the performance of, and therefore public affection for, the NHS in order to prepare it and us for the break-up and sale of our health service to private interests on the (carefully-created) grounds that the NHS needs to be ‘saved’, and that it’s all for our good. And they do it, by design, in ways which give them ‘plausible deniability’ – that allow them to say ‘the NHS is safe in our hands’ and ‘we’re protecting NHS spending’. The extent of the Treasury’s clawback in the last full financial year was at least £1.4 billion – 15 times more than the total deficit of all the NHS’ financially-struggling hospitals – even if you don’t offset the surplus that the remaining hospitals generated against it. The NHS does not have a financial problem, and no hospital has to be allowed to struggle and fail. There is plenty of surplus to cover the debts of a few, to pay the salaries of each of the 7,000 nurses that have lost their jobs under this government, and still to have most of it left over. The government chooses to treat each hospital trust in isolation and make it swim, or sink. But that’s not the limit of the government’s back-door robbery. The same amount again – in fact more – is being quietly bled off by the Dept of Heath (DH) to very partially mitigate the effects of swingeing cuts in another area. The new funding will further support and promote more joint working between health and social care. This will enable local areas to transform their services and to deliver better integrated care that saves money across the two systems. But this isn’t happening at all. The NHS Confederation – hardly a defender of true NHS principles – gave evidence that says the money is merely being used to ‘paper over the cracks’ caused by cuts to local government funding. They’ve even written a book with the title of ‘Papering over the cracks: the impact of social care funding on the NHS’. a further £300 million over and above the funding set out at the Spending Review for the period 2013–15. The new funding will further support and promote more joint working between health and social care. This will enable local areas to transform their services and to deliver better integrated care that saves money across the two systems. Again, these funds are supposed to save the NHS – and us – money, but as both the NHS Confederation and the RCN pointed out, this just isn’t happening. So, we’re up to £1.3 billion so far – almost as much as the Treasury euphemistically ‘clawed back’. But the government isn’t finished yet. It’s a very rough measure, but it gives an indication of the what it costs to treat people in hospital. According to the the Kings Fund, on any given day there are around 4,000 patients unnecessarily in hospital because of delayed discharges caused by lack of social care provision. £667 x 4,000 comes to a daily cost to the NHS of almost £2.7 million, or £973 million a year. The NHSC’s estimate of £545,000 per day, divided among these 4,000 patients, would mean a cost of only £136 a day, which seems unrealistically low. There are, of course, fixed costs that don’t vary with the number of patients, so the real figure will be somewhere in the middle, but in any event it’s a vast cost that is little appreciated outside the healthcare system – and the government is quite happy for it to be that way – and that includes ignoring the effects on waiting times for those who do need treatment, who consequently suffer longer and unnecessarily. But for the sake of argument, let’s use the Confederation’s figure of £200 million a year, so no one can say I’m exaggerating. Put that together with the £1bn taken every year from NHS funding to shore up social services that are falling apart because of cuts in other areas. 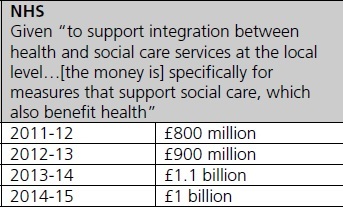 Then add the extra £300 million the government has added to the ‘social care drain’. Instead, this money is being taken away from front-line care for patients who need it, in order to inadequately ‘paper over the cracks’ – cracks that can only widen following Eric Pickles’ announcement this week in Parliament of further cuts to local government funding of 3-8% (although he factors this down to an average of 1.7% and calls this a ‘bargain’!). If he stays true to form, the higher cuts will fall on poorer areas because they will never vote Tory anyway, so that their effect on already-wobbling services will be catastrophic. These twin moves of Treasury theft and quiet transfer of funds to partially offset massive spending cuts in local government and therefore in social care are a massive con designed to allow the government to claim (though according to the UK Statistics Authority it’s untrue even then) that it is ‘protecting’ and even increasing NHS funding, when the reality is that significant percentages of the NHS’ funds never make it through to benefit patients or provide the staff and care that they need. It’s absolutely essential that the public starts to understand what’s going on. So spread the word and let’s counteract the propaganda and expose the con-trick. The continuing saga about the dismantling of our NHS. One think I would disagree with, is his statement about local authorities having to cut-back to protect essential services. This is not the case in ‘Labour’ run Manchester. They have cut funding to essential services and closed some down, to protect funding to their ‘ego’ projects, which are needless. They have spent money on a new Irish Heritage Centre, when there is nothing wrong with the present one. They are spending money on moving the Library Theatre and the Cornerhouse, needlessly, just so Ask Development can make money. The are covering Library Walk against the wishes of Manchester residents, as well as moving the Cenotaph. At a time of austerity, they should be ensuring the budgets of essential services is protected. But the only want to build more white elephant ivory towers, ’emperors clothes’. It is not just the Tories we need to get rid off, but also a Labour party which no longers represents the ordinary people.